How Long Would It Take to 3D Print Your Dream House? 3D printing is all the rage these days. The technology has been used to print a wide range of objects, from shoes and handguns to custom splints for medical applications. What they haven’t managed to 3D print yet are houses. Don’t expect that to happen anytime soon, though, because it’ll probably take a whole new kind of plastic to actually print a house that’ll last. Aside from the material, it’s also going to take an infinitesimally long amount of time given the size and capacities of current 3D printers. If you’re curious, real estate blog Movoto has come up with a calculator that’ll let you compute how long it’ll take to 3D print the house of your dreams. It will also provide you with a rough estimate of the cost of your 3D-printed home, along with the number of bricks your house will need. 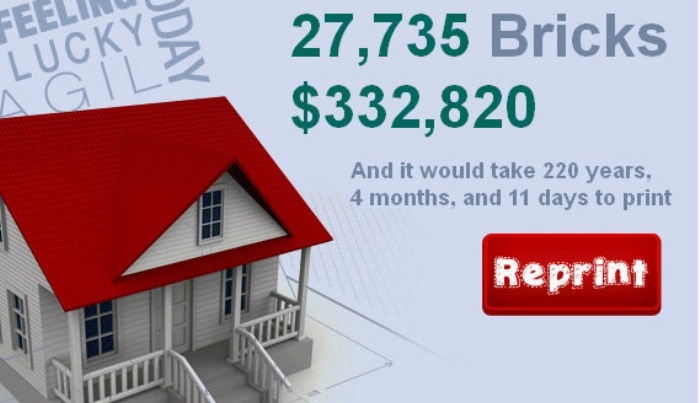 You can check out the 3D Print your House calculator online. 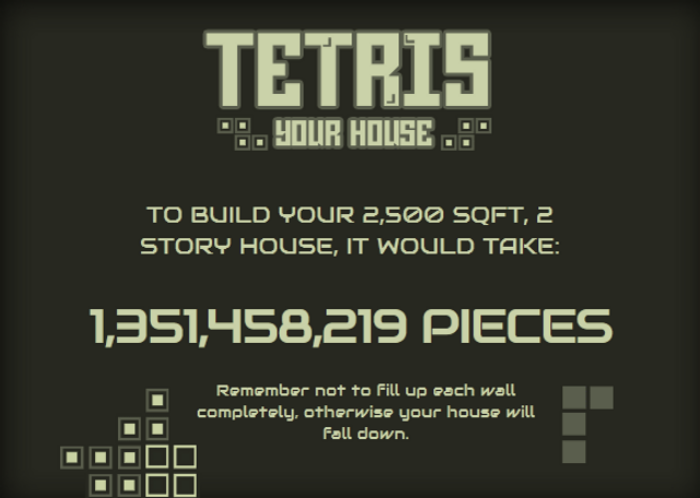 Tetris Your House: How Many Tetris Blocks Will It Take to Fill Up Your Home? By Hazel Chua on 03/22/13 • Leave a comment! They sure don’t make video games like they used to. There are only a few games nowadays that can truly make you use your old noggin. Remember Tetris? I remember spending many summer afternoons arranging Tetris blocks all over the screen with the game booted up on our old Family Computer.